For those who didn't have a chance to see the fashion of Cosmo Couture live (and our winning dress! ), you'll have a chance to hear about the creative process and see the dresses on display at the Corcoran. The panel discussion is TOMORROW (Sept 27th) and kicks off the exhibition Cosmo Couture in Gallery 31 (on view September 26–October 14) and the Cosmo Couture competition sponsored by the International Interior Design Association Mid-Atlantic Chapter. The panel will consist of representatives of the designers, manufacturers, and organizers of Cosmo Couture and the Corcoran Gallery of Art (unfortunately the Hickok Cole team won't be present since we'll be hosting Art Night at the same time!). For Cosmo Couture 2012, local architecture and interior design firms, and Corcoran interior design graduate students, joined their talents with manufacturing partners to create garments made out of industry materials such as wood veneer, carpet, tile, and wall covering. 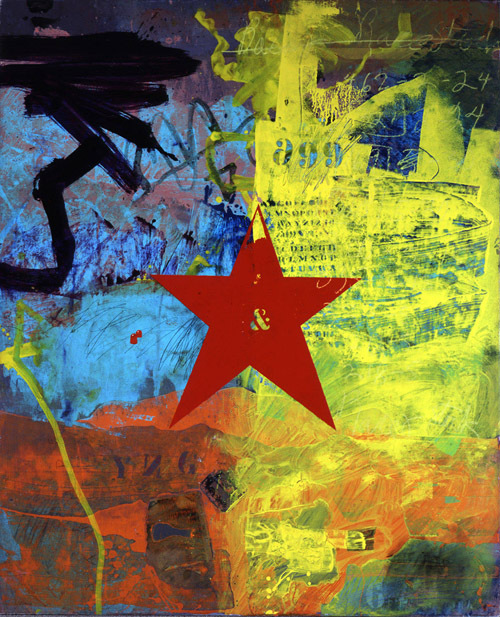 This year’s designs were inspired by Red Star (1970) by Raymond Saunders, a painting in the Corcoran’s collection. It should be a great panel -- led by my talented Corcoran mentor and professor Christy Schlesinger of Schlesinger Associate Architects!). Finally, here's some additional post show coverage: Washingtonian, the Examiner, and K Street Magazine. Total non sequitur, but anyone else going to (e)merge art fair next week? Too many great arts events to keep up with these days!